Bio-inspired Algorithms for Engineering builds a bridge between the proposed bio-inspired algorithms developed in the past few decades and their applications in real-life problems, not only in an academic context, but also in the real world. 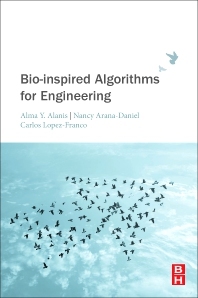 The book proposes novel algorithms to solve real-life, complex problems, combining well-known bio-inspired algorithms with new concepts, including both rigorous analyses and unique applications. It covers both theoretical and practical methodologies, allowing readers to learn more about the implementation of bio-inspired algorithms. This book is a useful resource for both academic and industrial engineers working on artificial intelligence, robotics, machine learning, vision, classification, pattern recognition, identification and control. Nancy Arana-Daniel received her B. Sc. Degree from the University of Guadalajara in 2000, and her M. Sc. And Ph.D. degrees in electric engineering with the special field in computer sicence from Research Center of the National Polytechnic Institute and Advanced Studies, CINVESTAV, in 2003 and 2007 respectively. She is currently a research fellow at the University of Guadalajara, in the Department of Computer Science Mxico, where she is working at the Laboratory of Intelligent Systems and the Research Center for Control Systems and Artificial Intelligence. She is IEEE Senior member and a member of National System of Researchers (SNI-1). She has published several papers in International Journals and Conferences and she has been technical manager of several projects that have been granted by the Nacional Council of Science and Technology (CONACYT). Also, se has collaborated in an international project granted by OPTREAT), She is Associated Editor of the Journal of Franklin Institute (Elsevier). Her research interests focus on applications of geometric algebra, geometric computing, machine learning, bio-inspired optimization, pattern recognition and robot navigation. Carlos Lpez-Franco received the Ph.D. degree in Computer Science in 2007 from the Center of Research and Advanced Studies, CINVESTAV, Mexico. He is currently a professor at the University of Guadalajara, Mexico, Computer Science Department, and member of the Intelligent Systems group. He is IEEE Senior member and a member of National System of Researchers) or SNI, level 1. His research interests include geometric algebra, computer vision, robotics and intelligent systems.